If your kids have a fondness for construction vehicles, check out Busy Days in Deerfield Valley by Bold Games. 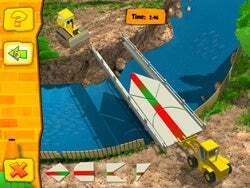 This cute and entertaining game features characters licensed from well-known farming and construction equipment vendor John Deere. Deerfield Valley is populated by anthropomorphized construction vehicles, including Danny Dozen, Barney Backhoe, Luke Loader, Grady Grader, and Eddie Excavator. These cute, big-eyed vehicles have lots of work to do—such as building a bridge, laying pipes, building a library, and more—and it’s up to you to help them. The game includes six separate activities: you can explore a map of Deerfield Valley, clicking on different areas to activate little animations; catch a raccoon that seems bent on trouble; or help Eddie Excavator and Danny Dozer lay pipe (you match the colored end of each pipe with a pipe that has the same color). You’ll help Luke Loader figure out how to put together pieces of a bridge, and help Danny Dozer clean up a construction site by pushing dirt, bricks and wood into waiting dump trucks. Unfortunately, the process of moving Danny Dozer around the site and operating his shovel isn’t as intuitive as it could have been. A sandbox mode lets you skip the planned activities and instead play with the vehicles to your heart’s content—digging holes and trenches, grading out rough spots, moving mounds of dirt and gravel from one location to the next, and more. There’s also a Pac Man-style maze game. Each activity is easy enough to be mastered by kids ages three to six. And three levels of difficulty will help keep players challenged. When players complete an activity, they are rewarded with coloring pages, which they can print and fill in away from the computer. Each image is printed as a full-page PDF file. (My kids ran to the printer, eager to color in the pictures.) I did run into one annoyance here: after printing, the game’s big, chubby cursor sometimes became overlaid with the system cursor. The problem disappeared when the screen changed or after a restart. Although the characters are clearly marked as John Deere vehicles, the cross-marketing is never too blatant. Players don’t have to sit through any spiel about the wonders of John Deere equipment. The game ships on hybrid CD for both Mac and Windows platforms. Installation requires about 300MB of hard disk space. This lets the game run without the CD-ROM in place, so kids can come back to it without needing to find the disc first. To play, you’ll need an 800MHz G3 or faster and Mac OS X 10.1.5 or later. The game is complemented by music and dialogue that suits the environment. It’s all presented in a friendly, non-threatening format that the preschool and kindergarten set are sure to love. Busy Days in Deerfield Valley isn’t an educational game—0it’s light John Deere-related fun. But the activities and games will keep kids occupied for a while. CONS: Cursor troubles; awkward controls in one game.